Home> Resource> iOS Transfer> How to Transfer Photos from iPod to Computer/PC? iPod are always used to listen to music anytime or anywhere you like. But if your iPod device comes with a color display, such as iPod touch, iPod nano or iPod classic, then it is undeniable that you can download, save or view pictures on these devices in the daily life. And if you have an iPod with built-in camera, like iPod touch, you can even take photos with the device directly. Thus, it is inevitable that you have stored lots of images on your iPod devices and with the development of time, you may have the need of exporting and saving the iPod photos on desktop computer for releasing more free spaces on your iPod devices, then what is the best way to backup your iPod images on your personal computer? Actually, when you want to backup photos from iPod touch/nano/classic to computer, the first way you can thought of may be iTunes. But if you have tried it by yourself, you may find this solution is useless here, because iTunes have no ability to move files like photos, music or movies from iDevice to computer due to its authority and copyright protection. But it doesn't mean that you have no way to achieve the goal on the desktop computer, the key point here is to find a professional yet reliable iPod Photo Transfer program as your helper. After that, all troubles in transferring iPod pictures to PC will be solved as easy as 1-2-3. To save your time and improve productivity, here we could like to strongly recommend MobiKin iPod to Computer Transfer for your reference. 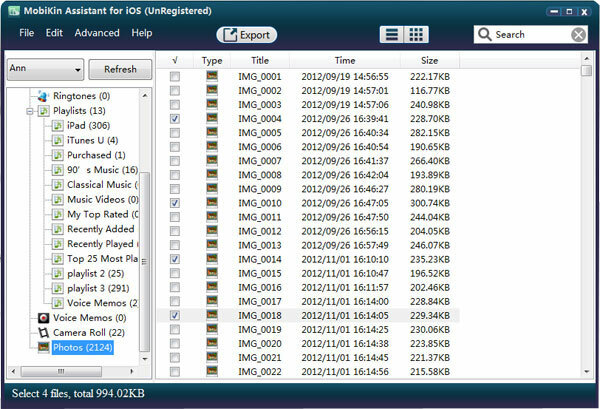 It allows you to transfer iPod photos or other files like music, movies, voice memos, books, playlist, etc. to desktop computer without losing. 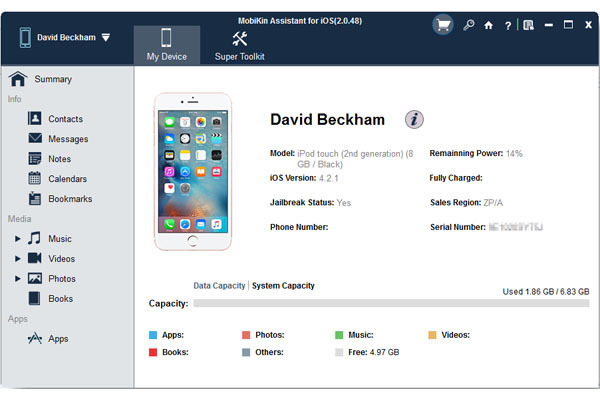 In addition to all models of iPod devices, other devices like iPhone and iPad are also supported by this powerful program very well. Therefore, once you owned this software here, you can deal with all file transferring problem from iDevice to computer. Cool, right? Here the free trial version is available in this page, you can get it and follow the below steps to start your own iPod photo transferring process. Tips: If you're a Mac user, you can go to here to learn more about MobiKin iPod to Mac Transfer program. iPod Photo Transfer - How to Copy Pictures from iPod to PC Easily? After that, click "Photos" in the left panel, and you can preview all pictures in the program in two different modes: List View Mode or Thumbnail View Mode. Select one of the mode to preview them and mark the image you wish to transfer. After that, you can click "Export" button to save the selected iPod pictures on PC completely. Here, you also can click the image button of hook on the top menu to select the whole files at one time and click "Export" button to transfer the whole folder to your computer with one simple click.